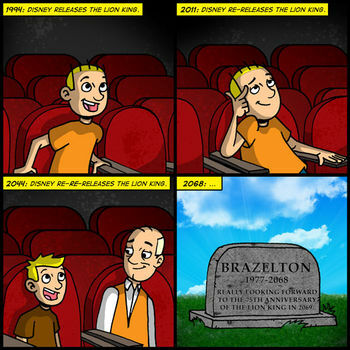 The Lion King is still tops at the box office, which I feel handcuffs me a little bit from a joke perspective. I don’t know why. I could have made a Moneyball joke, I guess. But I know nothing about sports. So why pretend? I was trying to kick around comic ideas on Twitter last night for The Lion King and several people recommended a play on it’s central theme – The Circle Of Life. I kind of intentially avoided it last week because I was certain other people have made those kind of jokes and done it better. But then I hit on something that I thought was authentic and kind of bittersweet at the same time. I think we all know that Disney will release and re-release their films into infinity. They’ve done it in the past and they’ll continue to do it. But what does that mean to me, the consumer, over the long haul. Heartfelt and cynical at the same time. See what I mean? Bittersweet. Take a moment to reflect on your mortality and then leave some comments below, why don’t you? Or, even better, share this comic with your friends! See the ShareThis app at the bottom of this post? You can share this comic ALL OVER THE PLACE now. I think it’s gonna ring true with a lot of people and you can be the one to introduce it to them. Facebook it, Twitter it and more!